After the Battle of Perryville on October 8, 1862, Confederate Gen. Braxton Bragg's Army of Mississippi abandoned its invasion of Kentucky and withdrew to Harrodsburg, Kentucky, where it was joined by Maj. Gen. Kirby Smith's army of 10,000 on October 10. Although Bragg's newly combined force was up to 38,000 veteran troops, he made no effort to regain the initiative. Maj. Gen. Don Carlos Buell, the Union commander at Perryville, was equally passive and refused to attack Bragg. Frustrated with his prospects in Kentucky and low on supplies, Bragg withdrew through the Cumberland Gap, passed through Knoxville and Chattanooga, turned northwest, and eventually stopped in Murfreesboro, Tennessee. His army, joined with Smith's Army of Kentucky and together renamed the Army of Tennessee as of November 20, took up a defensive position northwest of the city along the West Fork of the Stones River. During a visit by Confederate President Jefferson Davis on December 16, Bragg was ordered to send the infantry division of Maj. Gen. Carter L. Stevenson to Mississippi to assist in the defense of Vicksburg. The loss of Stevenson's 7,500 men would be sorely felt in the coming battle. Bragg reorganized his army, and Kirby Smith left for East Tennessee. Bragg commanded two corps, under Maj. Gen. William J. Hardee (divisions of Maj. Gens. John C. Breckinridge, Patrick R. Cleburne, and John P. McCown) and Maj. Gen. Leonidas Polk (divisions of Maj. Gens. Benjamin F. Cheatham and Jones M. Withers, and a cavalry command under Brig. Gen. Joseph Wheeler. Bragg had to deal with a command problem that became typical for him during the war—a virtual revolt of his senior generals, who petitioned Jefferson Davis to relieve him (in favor of Gen. Joseph E. Johnston, the commander of all armies in the Western Theater). Davis refused to relieve either Bragg or the rebellious generals. The Army of the Cumberland marched southeast the day after Christmas in three columns, or "wings", towards Murfreesboro, and they were effectively harassed by Wheeler's Confederate cavalry along the way, which delayed their movements. Although Rosecrans had reported his army to have 81,729 effectives in Nashville, his force on the march was barely more than half of that since he needed to protect his base and supply lines from the harassment of the Confederate cavalry. The left wing of 14,500 men under Maj. Gen. Thomas L. Crittenden (divisions of Brig. Gens. Thomas J. Wood, John M. Palmer, and Horatio P. Van Cleve) took a route that was parallel to the Nashville and Chattanooga Railroad, passing through La Vergne and south of Smyrna. The right wing of 16,000 men under Maj. Gen. Alexander M. McCook (divisions of Brig. Gens. Jefferson C. Davis, Richard W. Johnson, and Philip H. Sheridan) marched south along the Nolensville Turnpike to Nolensville, south to Triune, and then eastward to Murfreesboro. The center wing of 13,500 men under Maj. Gen. George Henry Thomas (divisions of Maj. Gen. Lovell H. Rousseau and Brig. Gens. James S. Negley, Speed S. Fry, and Robert B. Mitchell) moved south along the Wilson Turnpike and the Franklin Turnpike, parallel to the Nashville and Decatur Railroad, then eastward through Nolensville and along the same route used by Crittenden south of the Nashville and Chattanooga. Union cavalry under Brig. Gen. David S. Stanley (a single cavalry division under Col. John Kennett) preceded each of the three columns. The separation of the wings was designed to conduct a turning movement against Hardee at Triune, but when the Federal march began, Bragg moved Hardee back to Murfreesboro to avoid a confrontation. Murfreesboro was a small town in the Stones River Valley, a former state capital named for a colonel in the American Revolutionary War, Hardy Murfree. All through the war it was a center for strong Confederate sentiment, and Bragg and his men were warmly welcomed and entertained during the month of December. It was located in a rich agricultural region from which Bragg planned to provision his army and a position that he intended to use to block a potential Federal advance on Chattanooga. Hardee noted afterward that "The field of battle offered no particular advantages for defense." Despite this, Bragg was reluctant to move farther south, say to the arguably more defensible Duck River Valley, or farther north, to Stewart's Creek, where Rosecrans thought Bragg would defend. Sensitive to the political requirements that almost no Tennessee ground be yielded to Federal control, he chose the relatively flat area northwest of the politically influential city, straddling the Stones River. Portions of the area, particularly near the intersection of the Nashville Pike and the Nashville and Chattanooga Railroad, were characterized by small but dense cedar forests, in places more impenetrable to infantry than the Wilderness of Spotsylvania in Virginia. Short limestone outcroppings, separated by narrow cracks as if rows of teeth, impeded the movement of wagons and artillery. Hardee's Corps was initially placed in Triune, about 20 miles (32 km) to the west, Polk's on the west bank of the river, and a detached division from Hardee's Corps under Maj. Gen. John C. Breckinridge on the low hills east of the river. None of the troops were ordered to construct field fortifications. The armies bivouacked only 700 yards (640 m) from each other, and their bands started a musical battle that became a non-lethal preview of the next day's events. Northern musicians played "Yankee Doodle" and "Hail, Columbia" and they were answered by "Dixie" and "The Bonnie Blue Flag." Finally, one band started playing "Home Sweet Home" and the others joined in. Thousands of Northern and Southern soldiers sang the sentimental song together across the lines. Total casualties in the battle were 24,645: 12,906 on the Union side and 11,739 for the Confederates. 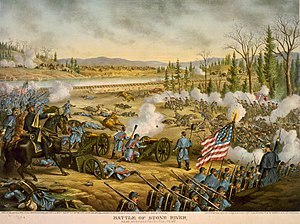 Considering that only about 76,400 men were engaged, this was the highest percentage of killed and wounded of any major battle in the Civil War, higher in absolute numbers than the infamous bloodbaths at Shiloh and Antietam earlier that year. Four brigadier generals were killed or mortally wounded: Confederate James E. Rains and Roger W. Hanson; Union Edward N. Kirk and Joshua W. Sill. The battle was tactically inconclusive. Bragg received almost universal scorn from his Confederate military colleagues; only the support of Joseph E. Johnston and President Jefferson Davis's inability to find a suitable replacement saved his command. The battle was very important to Union morale, as evidenced by Abraham Lincoln's letter to General Rosecrans: "You gave us a hard-earned victory, which had there been a defeat instead, the nation could scarcely have lived over." The Confederate threat to Kentucky and Middle Tennessee had been nullified, and Nashville was secure as a major Union supply base for the rest of the war. ↑ 2.0 2.1 2.2 Eicher, p. 428. Livermore, p. 97, lists present for duty 44,800 Union, 37,712 Confederate, and estimates effectives as 41,400 Union, 34,732 Confederate. Street, p. 159, repeats Livermore's effectives number. Kennedy, p. 154, cites 44,000 Union, 34,000 Confederate. Hess, p. 198, states that of the 37,712 Confederate effectives, 3,873 were cavalrymen. ↑ 3.0 3.1 3.2 Eicher, p. 428, Livermore p. 97. The NPS cites total casualties of Union 13,249, Confederate 10,266. Kennedy, p. 154, cites Union 13,000, Confederate 10,000. Street, p. 159, cites killed and wounded as 9,532 Union, 9,239 Confederate. McWhiney, p. 372, n. 71, approximates Confederate losses as 1,274 killed, 7,969 wounded, and 1,071 captured or missing; the latter number is lower than other sources because McWhiney believes other historians double-counted the wounded left at Murfreesboro. ↑ Cozzens, pp. 7-8; Eicher p. 419. ↑ Cozzens, pp. 29-30; Eicher, p. 371; Connelly, pp. 30-33; McDonough, p. 288. ↑ Eicher, p. 420; Cozzens, pp. 227-31. ↑ Connelly, pp. 26-29; McWhiney, pp. 325-30; Cozzens, pp. 10, 11, 29. ↑ Daniel, pp. 181-90; Cozzens, pp. 14-28. ↑ Kennedy, p. 150; Cozzens, p. 43; Eicher, pp. 417-19. ↑ Eicher, pp 419-20; McDonough, p. 291; Welcher, pp. 808-809, 818-19; Esposito, text for map 77; Cozzens, pp. 45-46, 219-26. ↑ Cozzens, pp. 30, 42-43, 60; McDonough, pp. 292-94; Connelly, pp. 45-46; Hess, p. 194; Horn, p. 196; McWhiney, p. 348. ↑ Eicher, p. 420; Cozzens, pp. 171-72; Street, pp. 96-97; Hess, p. 198. ↑ Street, pp. 98-99; Eicher, p. 420; Esposito, text for map 78; Daniel, pp. 205-207; Cozzens, pp. 64-80; Foote, p. 85. ↑ Eicher, p. 421; Cozzens, pp. 69-70; Street, p. 99. ↑ Cozzens, pp. 76-77; Daniel, p. 206; Esposito, text for map 78; Street, p. 99. ↑ Worsham, pp. 68-69; McPherson, p. 580; Foote, p. 86; Street, p. 99; Hess, p. 199; Lamers, p. 208. The bands anecdote is not mentioned by Cozzens's battle history. ↑ Street, pp. 114-17; McDonough, pp. 295-96; Cozzens, pp. 81-100; Eicher, pp. 421-22; Hess, pp. 197-203. ↑ Cozzens, pp. 128-30, 166; Daniel, p. 212; McDonough, pp. 299-301; Hess p. 215; Eicher, pp. 422, 424; Street, pp. 118-20; Welcher, p. 813. ↑ McDonough, pp. 296-98; Hattaway and Jones, pp. 320-21; Cozzens, pp. 79-80, 109-23, 221; Eicher, pp. 422-23; Foote, p. 88. ↑ Cozzens, pp. 159-61; Street, p. 123; McDoinough, pp. 303-304. ↑ Cozzens, pp. 151-66; Eicher, p. 424; Daniel, pp. 215-16; McDonough, pp. 210-15; Kennedy, p. 153; Foote, pp. 191-92; Hell's Half Acre, NPS Stones River site. Cozzens, the author of the most recent book-length description of the battle, does not refer to "Hell's Half Acre," but to the ground in front of the 31st Indiana, covered with the dead and wounded of Brig. Gen. James R. Chalmers's Mississippi Brigade, as the "Mississippi Half-Acre" (p. 153). ↑ Street, pp. 130-33; McDonough, p. 305; Cozzens, pp. 177-98. ↑ McDonough, pp. 305-307; Cozzens, p. A72-73; Lamers, pp. 235-37; Foote, p. 194. ↑ Cozzens, pp. 172-76; Eicher, p. 427; McDonough, p. 307; Street, p. 133; Foote, pp. 93-94. ↑ Esposito, text for map 83; Eicher, p. 427; Street, pp. 143-44. ↑ Esposito, text for map 83; McDonough, p. 308; Daniel, p. 219. ↑ McDonough, pp. 309-16; Street, pp. 145-55; Cozzens, pp. 177-98; Welcher, p. 817. ↑ Welcher, pp. 817-18; Esposito, text for map 83; McDonough, pp. 317-18; Daniel, pp. 213, 223. For the dates of the battle, see, for instance, the NPS battle summary. ↑ Street, p. 159; Esposito, text for map 83; Welcher, p. 818; Connelly, p. 67. ↑ Crittenden, p. 634; Daniel, p. 223. This is a playful modification of the expression "Brag is a good dog, but Holdfast is a better," which Rosecrans may have read in Charles Dickens's 1861 novel, Great Expectations, chapter 18. The Oxford Dictionary of Proverbs lists examples of this expression, which means "Tenacity and quietness of manner are preferable to ostentation," dating from 1709. ↑ McPherson, p. 582. See List of American Civil War battles#Major land battles. ↑ Street, pp. 159-61; Cozzens, pp. 199-207; McWhiney, pp. 374-92; McDonough, pp. 318-20. ↑ Welcher, p. 832; Eicher, p. 496; "Fortress Rosecrans" in the Tennessee Encyclopedia of History and Culture. ↑ Stones River National Cemetery. Crittenden, Thomas L. "The Union Left at Stone's River." In Battles and Leaders of the Civil War, vol. 3, edited by Robert Underwood Johnson and Clarence C. Buel. New York: Century Co., 1884-1888. OCLC 2048818. Livermore, Thomas L. Numbers and Losses in the Civil War in America 1861-65. Reprinted with errata, Dayton, OH: Morninside House, 1986. ISBN 0-527-57600-X. First published 1901 by Houghton Mifflin. Worsham, Dr. William J. Old Nineteenth Tennessee Regiment, C.S.A. June, 1861 – April, l865. Knoxville, TN: Paragon Printing, 1902.